District I: Burrillville, Central Falls, Cumberland, East Providence, Glocester, Lincoln, North Providence, North Smithfield, Pawtucket, Providence, Smithfield, Woonsocket. District II: Charlestown, Coventry, Cranston, East Greenwich, Exeter, Foster, Hopkinton, Johnston, Narragansett, New Shoreham, North Kingstown, Richmond, Scituate, South Kingstown, Warwick, West Greenwich, West Warwick, Westerly. 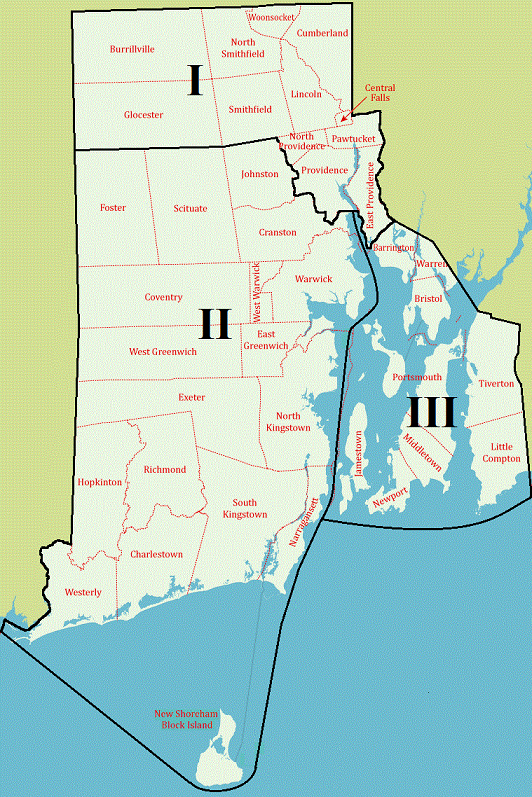 District III: Barrington, Bristol, Jamestown, Middletown, Newport, Portsmouth, Little Compton, Tiverton, Warren.